I got the warm fuzzies when Michele told me todays Ways to Use It Challenge at SCS would be FUZZY STUFF. (Check out her darling dolly sample.) I knew immediately that I would use this sparkly white flock for clouds. 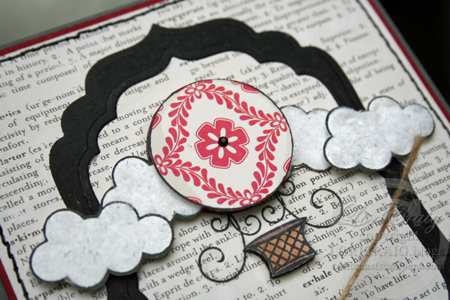 I stamped the clouds with Black Memento on white cardstock and cut them out. Then I used Aleen’s Tacky Glue to cover the inside of the clouds and gently pressed into the flock that I had poured out of the container, glue side down. I love how the white pops against the creamy tone of the text patterned paper (Cherry Hill – October Afternoon). The vintage balloon image is from Verve’s Up, Up & Away. I stamped the balloon on patterned paper for the red and cream design. It’s accented with a tiny black twinkle and raised up with dimensional dots. I added a little bit of depth to the balloon with Copic Markers W0 and W1 – my favorites for shading. The basket is colored with Copic E35. 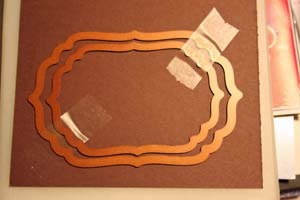 Arrange your Nestabilities, one inside the other and secure to cardstock with tape. I use 3M Satin (because it’s what I had on hand, not because I think it’s the only thing that will work) and taped the dies to the cardstock. 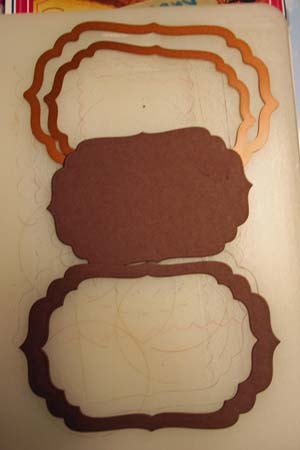 Then follow manufacturer’s instructions and pass the die thru the die cutting machine. Here it is right out of the machine. 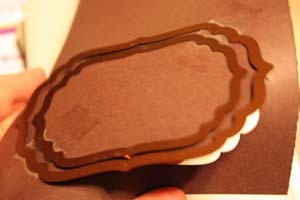 If you want to emboss the frame with your rubber mat, you would do that now while all of the pieces are still taped together. I hope you find time for the warm fuzzies today. School is back in session here, and I’m excited to have lunch with my girlfriends this afternoon. One of them is bringing her new grandbaby of the boy variety for us to ooh and ahhh over. Should be a simply fabulous time! 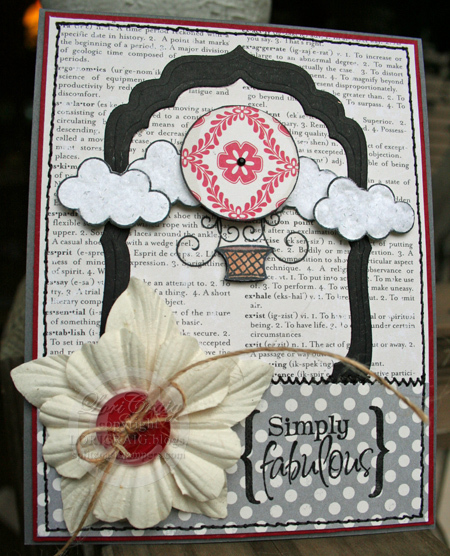 This entry was posted in Copics, Splitcoast Challenges, Tips & Tutorials, Verve Stamps. Bookmark the permalink. Stunning card…thanks for sharing your tip! I’m going to be back to take another look at that card, it’s so wonderful!! WOWZERS! That is GORGEOUS! I LOVE it! Oh my Lori!! I adore this charming card!! LOVE your pieced balloon! It’s fabulous!! And your Cherry Hill paper is the bomb!! Then there’s your sparkly, fluffy clouds….DREAMY!! LOVE this!! This is gorgeous, Lori! I LOVE all the dimension! This looks just dreamy Lori! Like the page of a wonderfully illustrated childrens book! HOLY MOLY girlfriend this is GORGEOUS!!! WOW!! Oh my goodness – looks so easy – I’ve gotta give that a try. Thx for the idea – and a great looking card! Lori!!! Are you kidding me, this is totally flippin’ fantastic! I just LOVE it!!!! !